Crabtree Homes Ltd, Frodsham are giving an exhibition regarding their new housing proposal in Tarvin, West of Townfield Lane and bounded by A51 and A54. Friday 8th July 3 – 7 and Saturday 9th July 10 – 2, Edna Rose room. Maybe we need more housing in the village? Would it be beneficial for Tarvin? Do we have the infrastructure? Do try and come and have a look at the proposal and give your comments. Images below outline the area in an aerial view and also show their outline for the development. The New Defibrillator – How to use it. 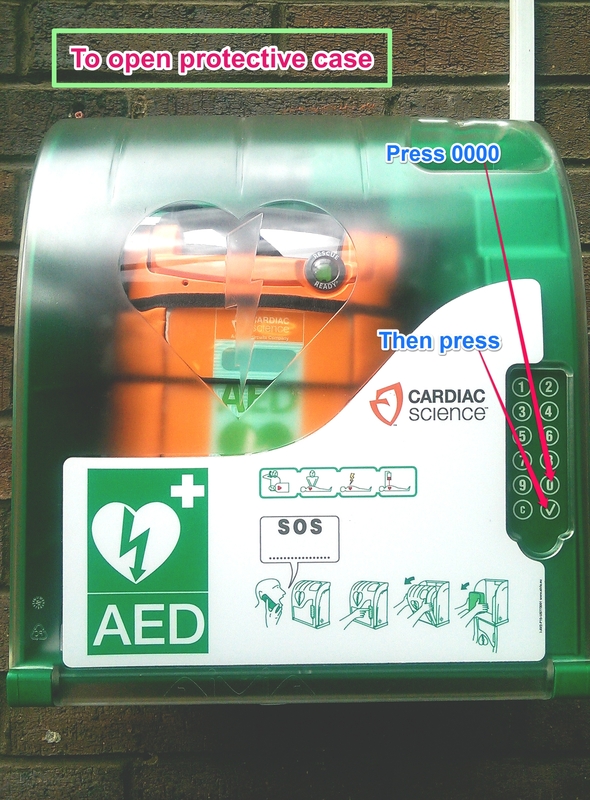 The Parish Council is delighted that the new defibrillator is now in place on the outside wall of the Community Centre and it has been properly registered with the North West Ambulance Service. Though they sincerely hope that it remains unused, it is now available should the need arise. The device is easy and safe to use, as spoken instructions are very clearly given. However it must be stressed that the machine does NOT REPLACE CPR (Cardiopulmonary Resuscitation) but is used in conjunction with it. Chest compressions are needed to pump blood around the body and rescue breaths are needed to put more oxygen in. Early CPR before the ambulance arrives has been proven to double or triple the chances of survival. If the heart has been kept oxygenated, it’s easier to re-start it. Until now the code that unlocks the defibrillator has been on the outer box. This has now been removed. You will get the code ONLY when you dial 999. Once open, remove the device and take it to where the patient – and the person doing CPR – is and open the pack. The instructions are clear and easy to follow. YOU CAN DO NO HARM TO THE PATIENT FROM THE PROPER USE OF THE MACHINE. There was a training session on CPR and the use of the defibrillator at the Community Centre recently. If you feel that you would like the opportunity to attend one locally, contact Mike Hassall on 01829 741075 and he will see if another one can be arranged. Alternatively, contact the local branch of St John’s Ambulance or The British Red Cross. We all hope we are never put in the position where we are confronted with the need to save a life, and even those who have had some basic training wonder if they would cope. But being able to do CPR – 30 chest compressions followed by 2 rescue breaths – will help pump oxygenated blood round the body’s vital organs. If another bystander can bring a defibrillator to you, then the chances of the patient surviving are greatly improved. 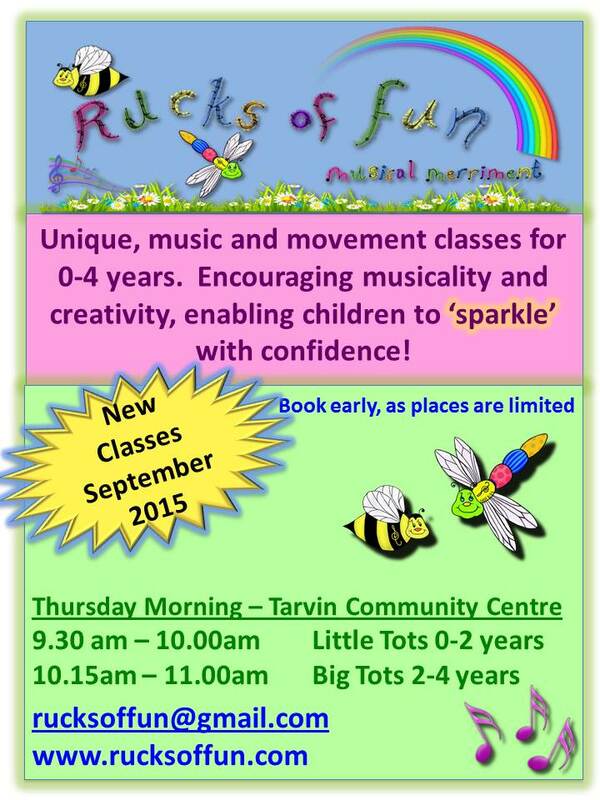 A new activity for little ones of musical merriment, will be coming to Tarvin Community Centre in September with Rucks of Fun! There will be two classes, 0-2yrs and 2-4yrs, where children will learn musicality and creativity in a stimulating and enjoyable way. The first class starts at 9:30 – 10:00, the second at 10:15 – 11:00 on a Thursday morning. Booking essential as places are limited. 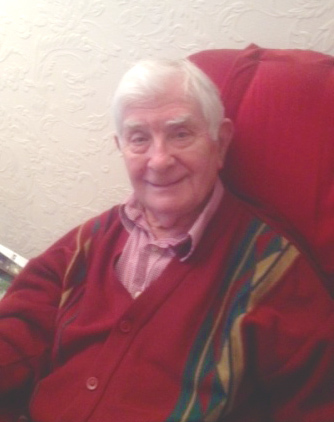 Welsh born Grenville came to live in Tarvin in 1970 and was one of the founder members of the Community Centre Committee before the building was actually commissioned in 1979. He was the first Treasurer. His connection with the Centre has been almost unbroken since then. The early years of the Community Centre were dominated by the drive and enthusiasm of the Tarvin Theatre Group, whose leading member, Edna Rose, is commemorated in the Community Centre. As well as the annual Pantomime, the group also produced summer musical events and one-off plays. Grenville was an enthusiastic performer in nearly all the productions and has played most of the key Panto characters. As was the tradition, his wife and daughters were also active members. The last Theatre Club performance was in 2002 when Grenville was part of the production team. The Theatre Club was the main source of funds for the running of the Centre, a fact that must have made ‘Treasurer’ Grenville very happy! Of course, the Community Centre has had its ups and downs, with the early years of this century being particularly stressful. At one time, Grenville, together with all the Committee, resigned, but his affection for and commitment to the place saw him back in harness some years later. His willingness to help whenever he could has been much appreciated and he will be much missed. Needless to say, the Community Centre hasn’t been the only area of interest and commitment in Grenville’s life. He was a founder member and first Secretary of the Tarvin Civic Trust and a Magistrate for 27 years. His commitment to St Andrews Church is deep and long-standing and he will continue with this into the future. How he managed all this and be the Headteacher of Bishop’s C of E Secondary School, is a mystery! Communities need people like Grenville and Tarvin has been fortunate to have him. It is common these days to mourn the passing of such people and to agonise on where they will come from next. But heroes often emerge when they are needed and the next Grenville is no doubt working quietly away at the moment to make Tarvin a great place to live………..you know who you are. The current Community Centre Committee wish Grenville a very happy retirement and would like to remind him that they will always welcome him back again should he get a bit bored! Last week the Community Centre was given a rare chance to meet with a writer/director as they started the creative journey to produce a piece of theatre. Sponsored by the Lowry Theatre and mentored by Cheshire Rural Touring Arts, Laura Lindow met a group of rural promoters at the Action Transport Theatre in Ellesmere Port. I would be delighted to be able to offer this play to Tarvin should it become available in the autumn menu. I would love to see how the gripping and evocative story I heard becomes a piece of theatre, so watch this space. By the way, when I said there was an elephant in the room I wasn’t kidding – the story did contain a real elephant……………… possibly!